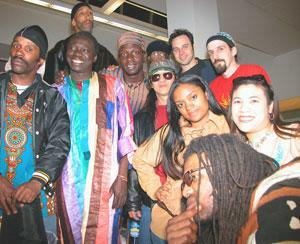 Over the past couple of decades, One World Tribe's music's been compared to the elemental sounds of groups and performers like Earth, Wind & Fire, War, and Santana – an earthy, funky, and worldly groove, the product of a truly multicultural, multi-musical collective of artists with real, and really diverse, chops. And, over the years, OWT has been no stranger to Erie stages, having played tons of memorable, colorful, cool-as-can-be shows in and around the Gem City. Now, to celebrate its 20th anniversary, the Tribe is bringing their musical feast back – for longtime fans and first-timers alike – to Erie's Bayfront for the Aug. 12 installment of 8 Great Tuesdays, where they'll be headlining and joined by special guest rockers Plato's Cave, another longtime area favorite reuniting for the very special event. For those who've been around Erie's jam scene for some time – say, the last couple decades or so – the players say it's surely gonna be an old-school party not be missed, reminiscent of the Grape Jam days of yore. And, for everyone who's newer to their sounds, the bands are sure to leave a fresh and lasting impression, a feeling of togetherness, a celebration of diversity, and a sense that we are all One. The show, like all other 8 Greats, is free and open to everyone, and starts at 6:30 p.m. at the Burger King Amphitheater at Liberty Park.